The showcase on Friday brought together some of Columbia's finest female comedic talent. Nuns who Juul, frisky ferris wheel escapades, sorority squabbles, and the patriarchy—no topic was off-limits at the Columbia Women in Comedy Showcase. Sourcing their material from audience suggestions, current events, and their Columbia experiences, some of Columbia’s finest female comedians performed pre-written sketches and improvised scenes, filling the Lerner Party Space with uproarious laughter. Hosted on Nov. 16, the second annual CWIC showcase featured female talent from five comedy groups on campus. 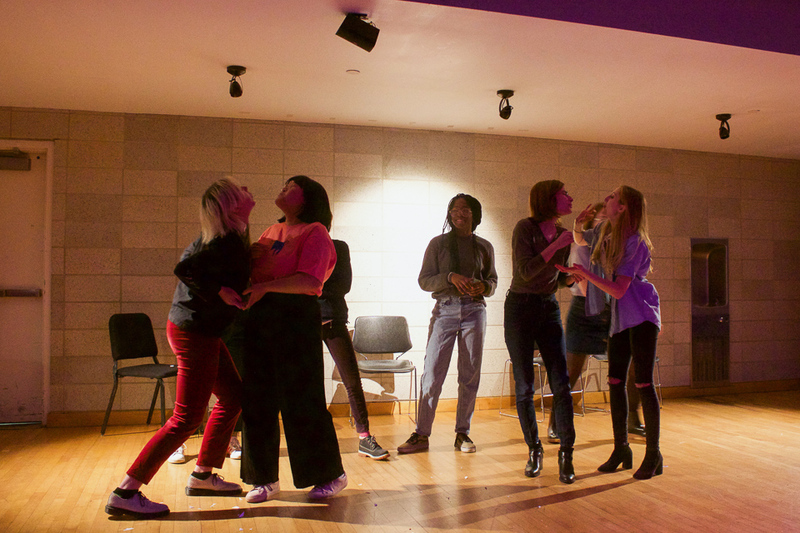 The Columbia University Sketch Show and Chowdah performed their usual style of sketch comedy, while Control Top, Third Wheel, and Fruit Paunch fearlessly improvised their performances based on one-word suggestions from the audience. Kicking off the show, CUSS presented a live reading of one of their video sketches, which they routinely produce and publish on their Facebook page. The sketch depicted a game show in which the female contestant’s objective is to correctly predict which of three (hilariously stereotypical) Columbia men will eventually ascend to the Supreme Court. The answer: all three, of course. Perhaps unsurprisingly, tongue-in-cheek takedowns of the patriarchy were recurring. At one point, emcee Dallas Koelling, CC ’20, filled a moment between performances by calling on a male audience member, asking him how his night was going. Doing a double-take with a half-smile, Koelling wondered aloud why she had invited a man to speak at a showcase for women’s voices. The crowd responded with cheers and thunderous applause. However, the showcase was not merely a platform to take stabs at the patriarchy. Rather, it was a celebration of female voices and the empowerment women find through comedy. Comedy, especially improvisation, requires vulnerability: Anyone performing ensemble comedy must wholeheartedly trust their fellow performers. When improvising a scene, they accept each other’s suggestions and build upon them, rescuing each other when jokes threaten to fall flat. With that in mind, this showcase created a unique space for women to take risks and build each other up. Fruit Paunch was an outstanding example of a group clearly founded on trust. The audience prompted them with “ferris wheel,” kickstarting a sequence about three couples taking a romantic turn on a ferris wheel while one (metaphorical) seventh wheel watches her friend’s purses. They shifted seamlessly from scene to scene, including a side-splitting bit about a teenager who is still washed, fed, and burped by her parents. Repeated returns to the ferris wheel scene lent a hilarious arc to their performance. Other highlights included Control Top’s portrayal of nuns, distraught because they have to quit smoking after they graduate from “nun training.” Fortunately, they can still Juul. It’s difficult to distinguish highlights when a show is as entertaining as CWIC’s showcase. Columbia might just have another Kate McKinnon on its hands. Or rather, a coalition of McKinnons.